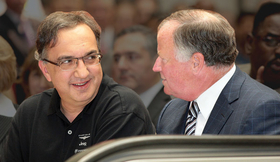 Chrysler CEO Sergio Marchionne, left, and Chairman Robert Kidder greeted employees at headquarters last Wednesday. Background: Accavitti, a Chrysler lifer, got a taste of Italian automaking early in his career. In 1987, he was a manufacturing engineer in the Chrysler-Maserati joint venture that produced the Chrysler TC sporty car. After that, he worked in Chrysler manufacturing, overseas in Southeast Asia and in product development and marketing. His most recent position was Chrysler LLC's director of brand marketing. Challenge: Dodge built its image on powerful, sporty cars. Accavitti must balance Dodge's traditional strengths with the need to meet the federal government's tough 35.5 mpg fleet average for 2016. Background: Chrysler is entrusting a Brit with Jeep, its most American-style brand. Manley, trained as an engineer in the United Kingdom, joined DaimlerChrysler's dealer operations there in 2000. He was named vice president for dealer operations of the Chrysler group in 2003. He worked his way up last year to executive vice president for international sales and global product planning. Challenge: Many critics say Jeep lost its way with watered-down vehicles that lacked off-road credentials, such as the Compass. Manley must decide whether to keep trying to broaden Jeep's appeal or return to its off-road roots. Background: No Chrysler lifer here, Fong spent 9 years as a U.S. Navy pilot before joining Lincoln Mercury in 1987 as a parts and service zone manager. He worked in Ford Motor's sales and marketing operations until he joined Chrysler last year. He was most recently director of Chrysler's mid-Atlantic business center. Challenge: Chrysler has the weakest image and products of the automaker's 3 brands. Fong has the most leeway of the 3 brand CEOs to plot a new mission as Fiat infuses Chrysler with fresh products. New job: CEO, Mopar Service and Parts and Customer Services, which includes customer service responsibility for the 3 vehicle brands. Background: Gorlier, an Italian, joined Fiat in 1989, starting in aftersales parts logistics. In 2004, he was put in charge of dealer network development at Fiat Group Automobiles. In 2007, he added the same duties at Case New Holland, the Fiat-owned manufacturer of agricultural and construction equipment based in Burr Ridge, Ill. Gorlier played a key role in Fiat's negotiations to take control of Chrysler. Challenge: Reinvigorate the Mopar brand and rebuild customer satisfaction through improved service and better customer relations methods. Chrysler CEO Sergio Marchionne has handed crucial operating responsibility to four executives as he launches the company out of bankruptcy and into an uncertain future. A whopping 23 managers will report to Marchionne, but the organization will revolve around the needs of the powerful new heads of the Chrysler, Dodge, Jeep and Mopar brands. The three Chrysler guys and one Fiat veteran who run the units will be in charge of restoring the glory of their brands. Manufacturing and product engineering operations will support those brands. The brand bosses will have the power to formulate product lineups, set volume targets, commission factory capacity, hire and fire advertising agencies and control marketing strategy. That's how Marchionne's brand chiefs do it at Fiat, which now controls Chrysler. "The focus of the brand organization is to rebuild and grow the company's four brands," the new CEO said in a statement after Fiat closed on its purchase of Chrysler LLC assets Tuesday, June 9. Chrysler emerged from Chapter 11 after the U.S. Supreme Court lifted a temporary halt to the deal. In revamping the organization, Marchionne is employing the same strategy he used to rebuild a shattered Fiat when he took over in June 2004. But there's a twist. In Marchionne's matrix structure, each of the four brand chiefs also has global responsibility for other functions that affect all brands. So Dodge boss Michael Accavitti will be in charge of global marketing strategy for all brands, and Chrysler brand CEO boss Peter Fong will run global sales strategy for all brands. Jeep CEO Michael Manley will run product planning companywide, and Mopar boss Pietro Gorlier will oversee customer satisfaction. That's Marchionne's way of maintaining maximum differentiation between brands but using the company's common resources wherever possible. With profit and loss responsibility for Jeep as a business, Manley will be in charge of making Jeep stand out as a brand. He will only put vehicles in his lineup that he expects to be profitable. But in his companywide product planning role, Manley will have an incentive to make sure the other brands get the products they need. This isn't the first time auto companies tried a matrix style organization, said Paul Reagan, a specialist in organization theory at the Wayne State University School of Business in Detroit. Ford tried it with Jacques Nasser's global Ford 2000 plan. Chrysler executives also had cross-functional responsibilities in the 1990s. "A matrix organization is difficult to implement and difficult to sustain," said Reagan. "If Fiat has the foresight to assemble implementation teams and put the right mid-level and senior managers in place with the right support, it will work like a dream." There could also be conflicts. Since Chrysler's boss is in charge of sales for all brands, he conceivably could set incentives to favor his division over Dodge and Jeep. Chrysler officials declined comment, saying details of the new structure are still being worked out. Such conflicts can be avoided by making sure the sales chief is rewarded for the performance of all three brands, not just his own, Reagan said. Gerald Meyers, professor at the Ross School of Business at the University of Michigan, said Marchionne's system poses problems for a company in such dire straits has Chrysler. "Chrysler has about 90 days to turn itself around get people buying products," said. "They shouldn't set up an organization that has internal conflicts, and this one does." The Chrysler brand bosses will commission their own advertising agencies the same as Fiat, Alfa Romeo and Lancia do in Europe. But media buying is centralized. Chrysler's existing system was more centralized. For example, BBDO, a unit of Omnicom Group, is the advertising agency for Chrysler, Dodge, Jeep and Mopar. Another Omnicom agency, PHD, handles media buying. While giving the brand bosses greater power, Marchionne also wants to guard against insulated brand fiefdoms. Earlier this year, Marchionne tweaked Fiat's organization structure by giving brand chiefs more cross-functional responsibility. At Fiat group, the brand structure has created product competition. The Fiat brand developed its small minivan, the Idea, in 2001. Lancia executives later decided to create its own version. Lancia's Musa appeared two years after the Idea but regularly outsold the Fiat version despite its higher price. The new structure is a throwback to the days when powerful division chiefs ruled in Detroit — executives such as John DeLorean at Chevrolet and Pontiac divisions in the 1960s and Robert Rewey at the Ford and Lincoln-Mercury divisions in the 1980s. Despite the brand strategy, John Wolkonowicz, analyst for Global Insight, says Marchionne faces considerable obstacles resuscitating Chrysler. Marchionne "has got lots of competition that didn't go through bankruptcy," Wolkonowicz said. "What's going to be different, and how is it going to cause more sales?" Reagan said "it's not realistic" for Marchionne to have 23 executives reporting directly to him. Of course, the CEO won't run the company alone. He announced last week that former co-President Jim Press will be his deputy CEO. Marchionne works a seven-day week. After addressing Chrysler employees in Detroit last Wednesday, he boarded a jet and flew overnight to Rome to present a fleet of vehicles to the G8 summit taking place there. Then he was scheduled to fly back to Detroit to run the management meetings this past weekend. Chrysler's bosses were to get a hint of the Marchionne management style last weekend. The new management team scheduled its first meetings on Saturday and Sunday in the Detroit area.